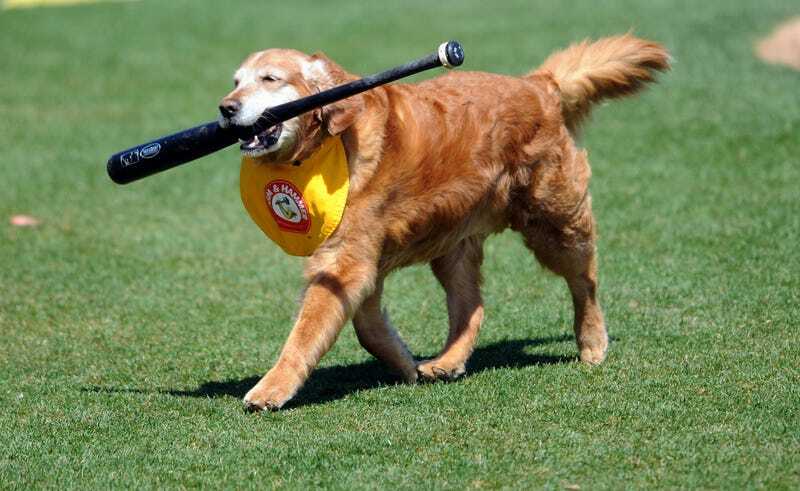 Chase, a Golden Retriever who since 2002 has fetched bats for the Trenton Thunder, passed away yesterday at the age of 13. Chase (full name: Chase That Golden Thunder) was one of the most popular fixtures at Thunder games for more than a decade, but slowed down in recent years as his muzzle turned gray and arthritis set in, and the bulk of his duties were turned over to his son Derby. In February, Chase was diagnosed with lymphoma and given just a few months to live. But fans had a chance to say goodbye. On Friday, just three days before his death, the Thunder held a retirement party. Chase's family was in attendance: besides Derby, there were two grandkids, Casey and Chief, who wore a bandana that read "Happy Birthday Grandpa." Another son named Ollie couldn't make it; he's the bat dog for the New Hampshire Fisher cats. Chase taught his boys well. Chase's human family was there for him too. Players and staff surrounded him as he was helped out onto the grass one last time. “He’s just a one-of-a-kind dog," Eric Lipsman, Trenton Thunder senior vice president of corporate sales, with whom Chase lived said Friday night at the retirement party. "That’s all I can say. He lived for this. He just absolutely loved to be out there on the field." Chase was scheduled to carry one final bat, but he wasn't able to work up the strength. Chase has seen more than a few of his players go on to the majors—the Thunder are the Yankees' AA affiliate—but he was content in the minors, making everyone's day just a little better. "I've never seen him not let anyone pet him," said Thunder manager Tony Franklin. NJ.com has two photo galleries. One, a look back at Chase's career, the other shots from his retirement party. The latter one especially should get you to bawling. The Thunder have asked that fans who want to honor Chase not send flowers or mementos to the team. Instead, consider a donation to the Trenton Thunder Charities or to your local animal shelter or pet rescue group. Baseball will miss Chase; he was a good boy.